Stylish and voted Best in Show! 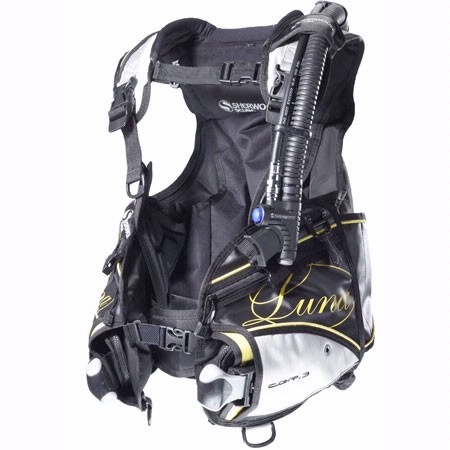 Luna features the CQR 3 weight pocket system for a more secure, comfortable dive. Two trim weight pockets hold up to 10 additional pounds. Jacket style BC wraps air completely around the body for easy floatation on the surface. 3 dimensional aircell. Elastic sternum strap and front closure that allow full inflation while eliminating “squeeze”. Easy oral and power inflation. Thick padding and a plush nylon interior. Sherwood’s Halfpac combines the cushiness of a soft pack vest with the stability of a hard pack. Two roomy, zippered pockets. Ready for Akona BC Pro Kit and QuickClip.